LIFEgroup Questions: Will the Planet Earth Survive? Do you worry about the end of the world? Why or why not? What things have you observed that you believe are signs the end is near? How do you think things will change when God lives with men on earth? How do you think things will be the same? Jesus says He will "make all things new." What is the one thing for which you are most excited to see the "new version"? Why? According to this passage, for whom is the new heaven and new earth reserved? Who will not be a part of the new creation? What is these people's destiny? How can Christians use this passage to encourage one another? After reading this passage, how does your relationship with God need to change? How should this passage lead us to interact with our unsaved neighbors/co-workers/friends? People shifted in their seats, looking first at each other, then down at their Bibles. Janice didn't seem to notice. She just kept on talking, answering almost every question in the guide before anyone else could speak. As the group members shuffled out after the study, Martha, the hostess, gave encouraging looks, as if to say, "I understand." She was concerned some might stop coming if Janice continued to dominate the group's discussions. Does this scenario sound famililar? Almost anyone who has been in a group study can identify with the feelings of frustration that result when one member controls. What can be done about a leader or group member who assumes the role of "expert" and dominates discussion? Todd Hunter is the creator of Three is Enough groups. These are micro groups designed to fascilitate spiritual formation in the lives of their members. Todd says, "Spiritual transformation into Christlikeness has always been the true goal of Christian faith—now it is utterly strategic." Three is Enough Groups have a double meaning: they are three friends or colleagues doing three simple and humble activities. Have each person list five things in life that bring them joy. Have each person talk about suffering they've recently endured. As a group, read James 1:2-4. What parts of this passage seem to go against common sense? What parts of this passage make sense? According to James, what is the purpose of suffering? What is perseverance? Make a list of synonyms for perseverance. Have a few people share how their past suffering helped them develop "perseverance". How can perseverance enable someone to grow in their relationship with God? List some ways perseverance is a character trait which enables us to better love the people around us. How would you describe a "mature Christian"? What are the character traits and personal habits of a mature Christian? Can someone be a mature Christian without suffering? Why or why not? Frances de Sales (1567-1622), a bishop of Geneva, Switzerland, was well known as a preacher and writer. "Do not be anxious about anything," [the Apostle Paul instructs us in Phil. 4:6]. Anxiety is the source of various temptations in the spiritual life. How exactly does it come about? Sadness is the grief we feel when we experience an evil contrary to our will. The evil may be exterior, such as poverty, sickness, or contempt; or interior, such as ignorance, spiritual dryness, discontent, or temptation. When the soul is conscious of some such trouble, it's downcast, and so sadness sets in. Then at once we begin to try to get rid of the trouble and to find the means to shake it off. So far, we have done no wrong, for it is natural to desire good and shun what we see to be evil. LIFEgroup Questions: Do I Have a Destiny? If you were given five minutes to speak to the U.S. Senate, what would you say? Paul says God doesn't "need" anything from us. How can that truth help you trust Him? Why is it sometimes hard to trust God? Would you rather control your own destiny or have God control it? Why? According to verse 27, God wants men to "reach out for him." What do you think it means to "reach out for God?" How do you "reach out for God?" Read verse 31. One common destiny awaits all men. Death and judgment. After the judgment, what destiny awaits those who did reach out for God? What destiny awaits those who did not? How should this truth change your life? How should it change your relationship with God? How should it change your relationship with the people around you? Our small group had been struggling to find the right study material. After a sermon one Sunday, I got an idea. The pastor's words had challanged me to take a step forward in my Christian life, but I easily lose the long-term value of the sermon without any follow-up to strengthen the message. Since our group members all attend the same church, I though, Why notbase our discussions on the sermons? I suggested the idea, and the group embraced it with enthusiasm. While we don't expect life-changing experiences every time, we have seen positive results. Here are a few ideas that worked for us. Preparation. I write down Scripture references and main points from the sermon each week and encourage other members to do the same. Ultimately, our opinion of "right and wrong" will have the most significant impact on our decision making. It is actually our decision making that is the practical application of our belief. This discussion is designed to be a biblical survey of decision making principles. Read Exodus 20:2-17 and/or make a list of the 10 Commandments. How might the 10 commandments serve as a guideline for living rightly today? Create a list of issues which don't seem to be covered by the 10 commandments. How might these 2 commands serve as a guideline for living rightly today? Create a list of issues which don't really fit under these two commands. Have someone in your group read each of the following passages. After each reading, have the group discuss how this passage can serve as a guideline in decision making: Psalm 119:105Proverbs 3:5-6Proverbs 15:22Romans 14:13-161 Corinthians 10:31-331 John 2:15-17As a group, read Galatians 5:18-25. 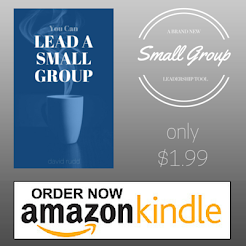 Small groups don't always turn out like we plan. But all God requires of a small-group leader is a faithful commitment to build friendships and invite people to see who Jesus is.